In a previous post we considered the basics of a SWOT analysis and why it might have fallen out of favour in some circles. In this post we will look at another problem in the way it is used, namely a failure to know what to do with the results. Nothing puts a group of people off an exercise like knowing that nothing will be done with output of their thinking. 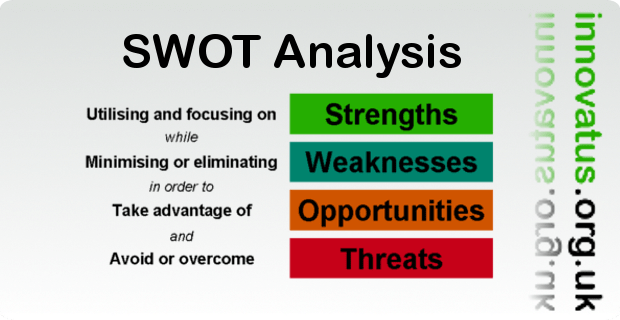 If SWOT analysis is to have any power, then we must be clear about how to move from the analysis to the formulation of a strategy. It might be helpful to re-arrange the results of the first part of a SWOT analysis into a table as shown below so that the beginnings of the strategy can become clearer. After this the next step is to identify specific strategies for the future based on certain elements of the analysis. Ah good-old SWOT analysis. I remember old boss way back was really into this. He would not start a new project without it. But when applied to the church, the God factor performs a bit of a laplace transform on your swot matrix! Strengths – don’t ever rely on them. “Focussing” on them is a dangerous game because.. Weakness – that’s when we trust God properly. “eliminate” them and you no longer need God! Opportunities – well run out of something to say for that one! I’m always a bit of sceptic with this management speak and church, as you know.